If you have a misaligned smile affecting your self-esteem, Sedation Dentistry of San Jose offers a solution to help you regain confidence in your appearance. We offer a range of orthodontic options, ranging from methods which you may see results in above average time to aesthetic treatments that blend in with your natural teeth. Dr. Tom H. Clark creates treatment plans customized to each patient’s unique smile to ensure the best outcomes. With the orthodontic systems available at our San Jose dental practice, Dr. Clark helps you select the best method to efficiently align your teeth. Your individualized treatment plan helps you achieve the smile you have always wanted as quickly as possible. Fastbraces® straighten teeth in 12 months or less utilizing a patented bracket system. This system is great for both young patients and adults. With this teeth aligning method, patients do not have to wear a retainer for long periods of time once treatment is complete, you are only advised to have a retainer in for approximately 15 to 20 minutes a day. Six Month Smiles provides what the name suggests: a straighter smile in approximately six months’ time. This orthodontic system utilizes tooth-colored wiring and brackets. This alignment method helps you obtain a straight smile without compromising your aesthetic, and you do not have to consciously remember to take invisible trays out and put them back in after meals. ClearCorrect Aligners are a discreet way to straighten your teeth without bulky orthodontic appliances. While using this orthodontic system, you do not have to adhere to any dietary restrictions; simply remove your braces to avoid damaging them with certain crunchy or sticky foods. MTM® Clear •Aligner is a virtually invisible method of aligning your smile without the use of metal wires. They are ideal for patients who need slight orthodontic work, especially towards the six front teeth, though they do correct other mild cases of crowding or gaps as well. 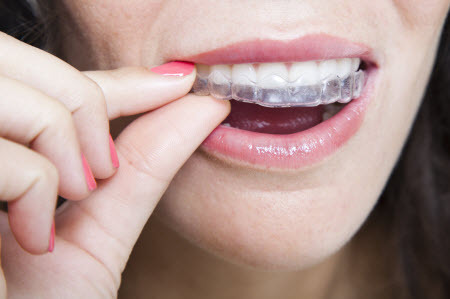 MTM aligners straighten teeth without drawing attention to your orthodontics. If you are looking for solutions to straighten your teeth, call our San Jose practice to schedule a consultation with Dr. Clark. He and his capable team help patients reach their dental goals and regain confidence in their smiles!